The history of the puttanesca sauce recipe is interesting. Some say, because of the italian translation of the name, puttanesca, which means prostitute, that this was a whore's favorite meal; in my mind the real story is slightly different, though. favorite restaurant in Ischia, Italy. More about Ischia here. The owner quickly informed them he was about to close and thus didn't have anything to serve them... The clients, being very hungry as they were, simply replied: "Facci una puttanata qualsiasi", meaning just cook us anything! So the owner turned around and using what he had left in his kitchen, he improvised that night and created the puttanesca sauce! As is, this recipe provides 4 portions. Make sure you have olives, parsley and capers left for the end to be used for presentation. Add all the anchovies, crush well with a fork. 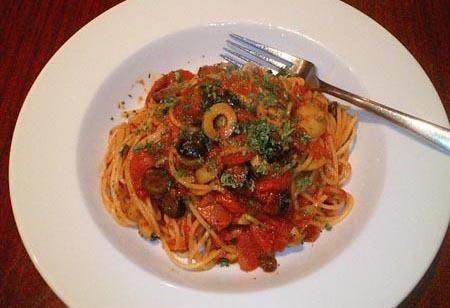 Mix in the tomatoes, olives, capers and the chili, cook over medium high heat for 10 minutes, stirring occasionally. Add the parsley and cook the sauce a little more. Put the ready and drained pasta in the pan, top with the sauce and toss pasta to coat. Now, sprinkle some fresh chopped parsley.